A Complete Children's Bible Just for Them, now with Reading Plans and Stickers! The ground breaking complete Catholic Children’s Bible from Saint Mary's Press is back with even more to love! With new stickers and reading plans–it not only inspires, but empowers children to read, live, understand, and love the Word of God. The stories of our Catholic faith come alive with vivid, awe-inspiring artwork, larger text, and many more design features that not only enhance comprehension but create enjoyment as well. Reading Plans with stickers guide children through themes like Great People of Faith, the Miracles of Jesus, Following Jesus, and The Mass. Intentional design elements such as fonts built for early readers, increased line spacing, bold vocabulary words, colorized text, minimal hyphenation, and simple column dividers help make this a Bible children can read on their own. Unique navigational features such as colorized tabs, large chapter and verse numbers, full Scripture references, and clear and concise story titles, are all designed specifically for early readers and to help children easily locate passages and stories. Young children will be able to understand and relate to God’s Word through the Understand It! and Tell It! sections, bold vocabulary words and easy-to-understand definitions, the realistic artwork and borders, the introductions to the Old and New Testaments, and the many pictures, maps, and time lines that are included throughout the Bible. *Which Bible is right for you? View our helpful guide here! The first-ever Catholic Children’s Bible is now better than ever! This complete Bible, in a revised edition, inspires and empowers children to read, understand, and love the Word of God, in a revised edition. 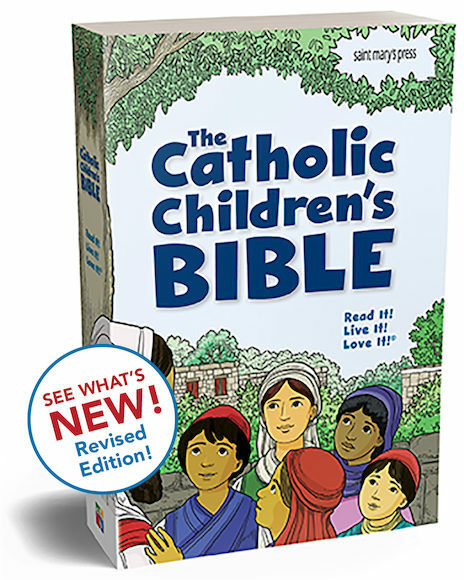 The first-ever hard cover Catholic Children’s Bible is now better than ever! This complete Bible, in a revised edition, inspires and empowers children to read, understand, and love the Word of God, in a revised edition. La Biblia católica para niños es la primera Biblia completa para niños, que no solo inspira, sino que otorga a los niños el poder para que lean, vivan, comprendan y amen la Palabra de Dios. The Catholic Children’s Bible Leader Guide is the perfect tool to help lead young children to a deeper understanding of Scripture. La Biblia católica para niños Guía para el líder is the perfect tool to help you introduce children to Scripture! The Catholic Children’s Bible Activity Booklet introduces children to Scripture, reinforces the Scripture message, and helps children incorporate that message into their everyday lives. El cuaderno de actividades para la Biblia católica para niños is a wonderful way to expand upon a collection of 40 featured Bible stories from La Biblia católica para niños. BRIDGE THE GAP BETWEEN TEACHING RELIGION AND READING! The Catholic Children’s Bible Strategic Reading Resource is a first of its kind, using forty powerful stories from Sacred Scripture to bridge the gap between teaching religion and reading. Daily prayers, learned by heart, are a wonderful way for children to stay close to God. The Catholic Children’s Prayer Book was designed to introduce young children to the beautiful prayers of our Catholic faith. Read It! Live It! Love It! Color It! The Forgiving Father Bible Big Book expands on one of the featured stories, The Forgiving Father, from The Catholic Children’s Bible. The Forgiving Father Tell It! Cards highlight key people and events from the well-loved story in The Catholic Children’s Bible. The cards will help young children understand and remember the story by encouraging them to retell the story in their own words. Each card is printed on 4.25" x 4.25" card stock, so they are easy-to-read and are laminated for added durability. The Forgiving Father Vocabulary Cards highlight the important words and definitions for young children to learn from the well-loved story in The Catholic Children's Bible. Designed for young children, the words and definitions are presented in an understandable and engaging way. Each card is printed on 5.5" x 4.25" card stock, so they are easy-to-read and are laminated for added durability. The Baptism of Jesus Bible Big Book expands on one of the featured stories, Jesus Obeys his Heavenly Father, from The Catholic Children’s Bible. The Baptism of Jesus Tell It! Cards highlight key people and events from the well-loved story in The Catholic Children’s Bible. The Baptism of Jesus Vocabulary Cards highlight the important words and definitions for young children to learn from the well-loved story in The Catholic Children's Bible. The Good Shepherd Bible Big Book expands on one of the featured stories, Jesus is the Good Shepherd, from The Catholic Children’s Bible. The Good Shepherd Tell It! Cards highlight key people and events from the well-loved story in The Catholic Children’s Bible. The Good Shepherd Vocabulary Cards highlight the important words and definitions for young children to learn from the well-loved story in The Catholic Children's Bible. Jesus Feeds a Huge Crowd Bible Big Book expands on one of the featured stories, Jesus Feeds a Huge Crowd, from The Catholic Children’s Bible. Jesus Feeds a Huge Crowd Tell It! Cards highlight key people and events from the well-loved story in The Catholic Children’s Bible. The Jesus Feeds a Huge Crowd Vocabulary Cards highlight the important words and definitions for young children to learn from the well-loved story in The Catholic Children's Bible. The Last Supper Bible Big Book expands on one of the featured stories, The Last Supper, from The Catholic Children’s Bible. The Last Supper Tell It! Cards highlight key people and events from the well-loved story in The Catholic Children’s Bible. The Last Supper Vocabulary Cards highlight the important words and definitions for young children to learn from the well-loved story in The Catholic Children's Bible. The Noah and the Flood Bible Big Book expands on one of the featured stories, God Saves Noah's Family, from The Catholic Children’s Bible. The Noah and the Flood Tell It! Cards highlight key people and events from the well-loved story in The Catholic Children’s Bible. The Noah and the Flood Vocabulary Cards highlight the important words and definitions for young children to learn from the well-loved story in The Catholic Children's Bible. The David and Goliath Bible Big Book expands on one of the featured stories, God Helps David to Defeat Goliath, from The Catholic Children’s Bible. The David and Goliath Tell It! Cards highlight key people and events from the well-loved story in The Catholic Children’s Bible. The Jonah and the Big Fish Bible Big Book expands on one of the featured stories, Jonah Runs Away Instead of Obeying God, from The Catholic Children’s Bible. The Jonah and the Big Fish Tell It! Cards highlight key people and events from the well-loved story in The Catholic Children’s Bible. The Jonah and the Big Fish Vocabulary Cards highlight the important words and definitions for young children to learn from the well-loved story in The Catholic Children's Bible. The God Calls Samuel Bible Big Book expands on one of the featured stories from The Catholic Children’s Bible. The God Calls Samuel Tell It! Cards highlight key people and events from the well-loved story in The Catholic Children’s Bible. The God Calls Samuel Vocabulary Cards highlight the important words and definitions for young children to learn from the well-loved story in The Catholic Children's Bible. The Moses and the Ten Commandments Bible Big Book expands on one of the featured stories, God Gives His People the Ten Commandments, from The Catholic Children’s Bible. The Student Books are full-color, reduced size (6" x 9") Bible Big Book replicas, perfect for children to use individually or in small groups. The Guiding Comprehension Questions that are in the Bible Big Books are also included in the Student Books as a reminder of key points from the story. The Student Books are available in a package of 6. The Moses and the Ten Commandments Tell It! Cards highlight key people and events from the well-loved story in The Catholic Children’s Bible. The Moses and the Ten Commandments Vocabulary Cards highlight the important words and definitions for young children to learn from the well-loved story in The Catholic Children's Bible. Review by Bridget Simpson, Pensacola/Tallahassee FL. Review by Pat Solenski, St. Anthony Parish Religious Education, Fort Lauderdale, FL. Review by Claudia Lugo, St. Paul the Apostle Catholic Church, Chino Hills, CA. Review by Silvia Zaborowski, Our Lady of Mount Carmel Catholic Church, Buckeye Lake, OH. Review by A. Karina Plascencia, parent and catechist, Office of Religious Education, Los Angeles, California. Review by Gina Esposito, St. Mary's Parish, OH.